As the curtains parted, “Esperanza” itself was quite literally seen from the strings of fairy lights that illuminated the entire stage, giving rise to an almost magical atmosphere. 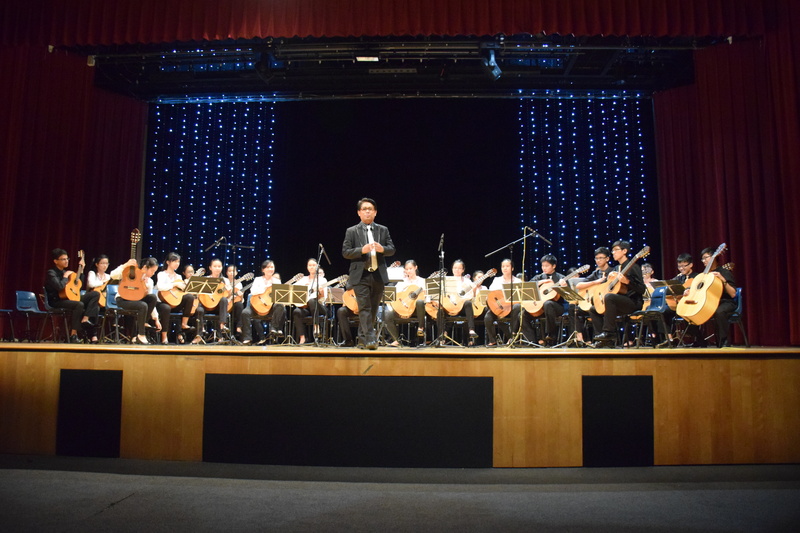 This theme represented the hope that Raffles Guitar Ensemble (RJGE) wished to bring to the audience with their music, and we can assuredly say that they achieved what they set out to do. The concert kicked off with the main ensemble performing a selection of lilting tunes such as “Summers Wind” and “Coup de Couer – Les Reves du Matin”. “Summers Wind” was an uplifting and pleasant piece, which occasionally inherited mysterious undertones at times, but edged the audience into a spirit of light-hearted nostalgia with pizzicato plucking in the main melody. “Coup de Couer – Les Reves du Matin”, on the other hand, was a piece that commenced deceptively cheerfully but took its audience on a rollercoaster of emotional highs and lows. Halfway through the performance, the peaceful tones smoothly transitioned into a wistful melody with a series of deep, resonant notes, as the ensemble employed a few pregnant pauses to allow a dark and melancholic mood to settle in. This heavy mood then swelled as rapid and slightly disconcerting riffs crescendoed until the ensemble eventually burst into an abruptly ecstatic melody. The overwhelming enthusiasm in the piece was quickly tempered, as the ensemble gently brought across the final cadences of the piece. This performance truly kept the audience on the edge of their seats, engaging the dynamics of music to accentuate its mystifying nature. 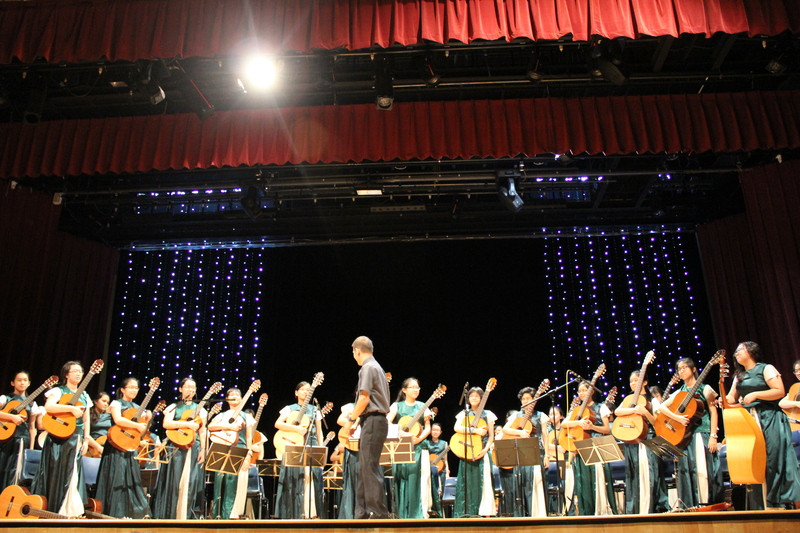 All pieces by the RJGE main ensemble, including two other pieces of Ai No Kurashi and Scherzino Mexicano, were conducted by Mr Michael Gaspar, a graduate of LaSalle College of the Arts with a Diploma in Music who has picked up numerous awards in his professional career as a guitarist such as the Grand Prix awards in the Singapore Guitar Festival. Following the Main Ensemble, the Junior Ensemble put on a wonderful performance, made all the more impressive by the fact that it was their first time on stage. According to Mr Gaspar, the confidence level of the Year 5 batch was remarkable, seeing that the time they had to learn the pieces was very limited. 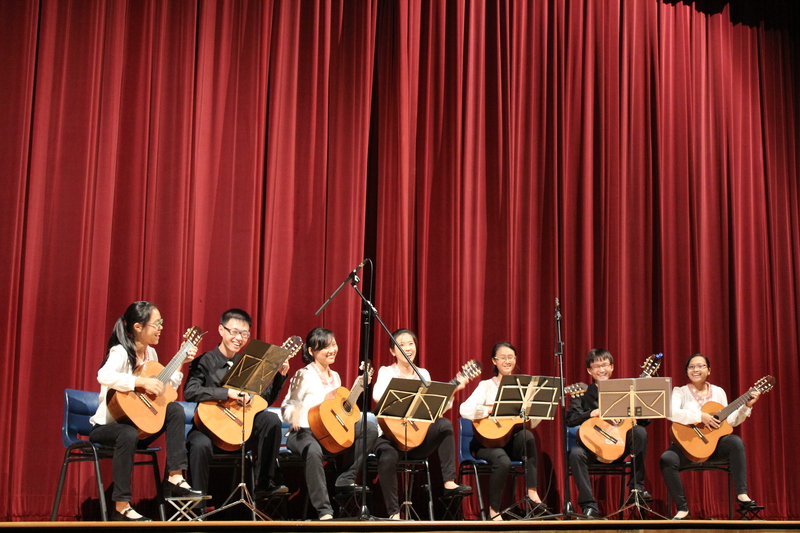 Classical guitar pieces including “Calypso” and “English Country Garden” allowed the audience to unwind with their spirit-lifting and cheerful tunes. Backed up by the Year 5 batch on guitar, the impressive rendition of OneRepublic’s “Counting Stars” also put vocalists Alina Sng, Alyssa Chua, Sarah Chooi and Jaron Chong in the limelight. They took turns to display their vocal prowess to the audience, and their solid harmonies certainly did not fail to enrapture and entertain, seeing that some members of the audience were bobbing their heads along to the catchy tune. However, it was unfortunate that their vocals, perhaps a tad too powerful, drowned out the ensemble’s accompaniment. The performance, though already outstanding, could have been improved with better sound balance. 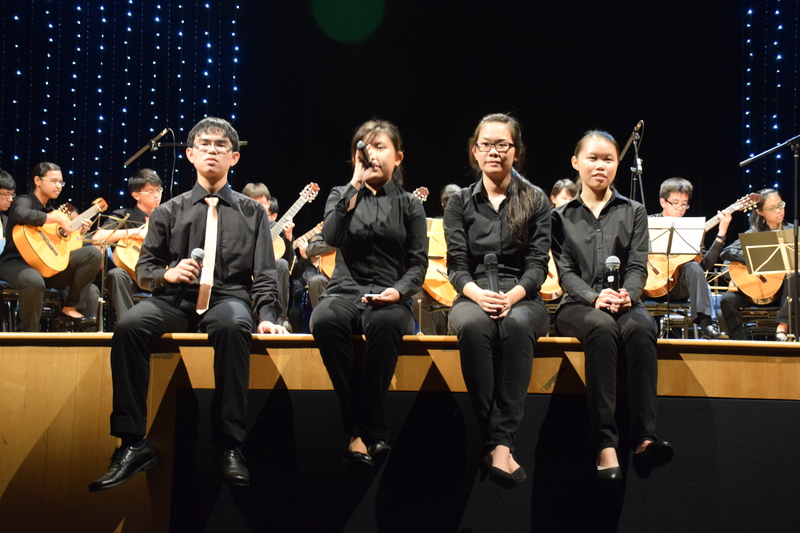 The concert could not have been complete without guest performers from the Raffles Girls Guitar Ensemble (RGGE). Decked in elegant, flowy gowns, the ensemble worked harmoniously, greeting the audience with lively tunes such as Howl’s Moving Castle Theme – “Promise of the World”, and “Tango” which got the audience’s feet tapping. It was clear from their fluid performance that they had had months of practice under their belt and were truly passionate about their music. Their enthusiasm truly rubbed off on the audience, who thoroughly enjoyed their pieces. A highlight of the RGGE’s time on stage was “Duet” performed by Lim Jiahui and Joelle Ocampo. The two had near-perfect coordination, fingers skipping over the frets deftly with only eye contact as communication between them. The connection between the two performers in their unspoken understanding, provided the audience brief glimpses of the chemistry that guitarists share. What was even more admirable and impressive was that the pair did not have, or rather need, to refer to score sheets. What a testament to their skill and the effort that they put into the performance! The chemistry between performers was also demonstrated through smaller group items as performed by the different sections of the RJGE; sections took turns to charm the audience with themed, often colourful costumes, showing off their wide repertoire of songs. Examples included recent hit “Let Her Go” by Alto 1, while Prime section performed “Itsumo Nando Demo” from the movie “Spirited Away” by the widely acclaimed musical composer Joe Hisaishi. “Childhood Memories” by Alto 2 was a vivid performance featuring familiar tunes which ignited fervent chatter amongst audience members each time someone managed to identify a song. Incorporating melodies like the theme song of Doraemon allowed each member of audience to reconnect with his or her cherished childhood memories. “I Believe”, the theme song of hit Korean drama “My Sassy Girl” performed by Bass section, certainly enlivened some K-pop fans in the audience. Other performances included “Air On A G String” by the Executive Committee of RJGE and “One” by Yu Chen and Zong Tai. “Little Talks” by Anabelle, Wei Sheng, Alysia and Nicholas even ventured into other instruments such as conga drums, which infused a clear sense of rhythm. This definitely demonstrated the sheer versatility and talent present within the RJGE community. Watching the sections and groups perform individually also allowed the audience to engage themselves in the unique camaraderie that each performing group had developed over hours of practising together. While the pieces may not have been perfect, it was clear that the sections had given it their all. This was sufficient for those in the audience that day, and the overall atmosphere of the concert was in general a joyful one. At 9.30pm, the curtain was brought down after a final item by the main ensemble: “Tanquillo de Cadiz”, a particularly rhythmic piece incorporating powerful strumming and strong bass tones to create a warm and lively mood- the perfect recipe for an impressive finale. However, the concert wasn’t over just yet. As the emcees took the stage, the audience quickly caught on to the emcees’ hints at more to come, cheering the guitarists on with cries of ‘Encore!’ True enough, the guitar ensemble was ready with what was considered by most to be the highlight of the evening. After an introduction to the encore piece by Mr Gaspar and a brief prelude by the main ensemble, the rest of the ensemble drew laughter and applause when they entered decked out with ukuleles and brightly-coloured leis to line the front of the stage. The two teachers-in-charge, Mdm Low Chor Huang and Mr Winston Cheong were not spared the Hawaiian treatment either! With that, the ensemble began “Aloha Oe” (Farewell to Thee), a folk song by a Hawaiian princess that was adapted into English by Elvis Presley in the movie “Blue Hawaii”. “I liked how different styles of music were played on different instruments. It was a quirky but heartwarming ending,” said Xu Yanling of 15S03C. 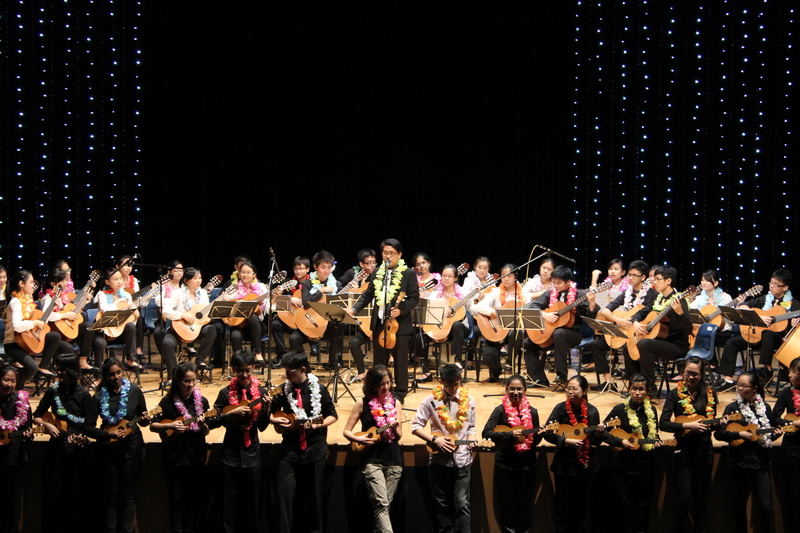 Truly, the mellow, cheerful chords of the ukulele complemented the main ensemble’s smooth harmonies, and light-hearted “Aloha!”s from the entire ensemble ended off the concert on a brilliant note.